I bought the biggest and the hottest jalapenos/Chillies available in the local market.I tried to make stuffed chilli for the evening snack. A popular dish in India, freshly made, by street hawkers. 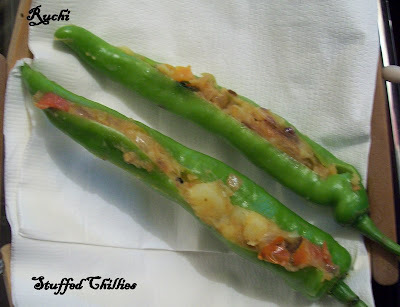 They are called Mirchi Bada. Everyone thought that these would be spicy, But they are not at all spicy and even a small kid can eat them . 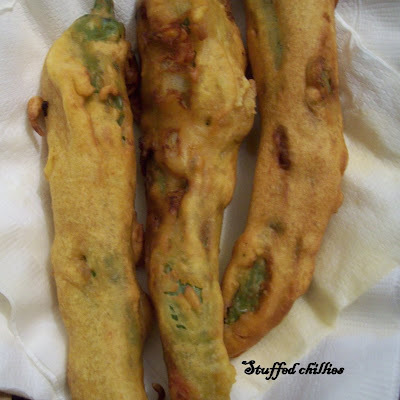 It is the best snack for teatime or Here you can make this fine-tasting accompaniment to a main meal - or indeed can be eaten alone as a sort of snack.It is favorite of many people In Mumbai This is mine and my husband's all-time favorite snack. Everyone in our family just loves it. 1. Peel and grate boiled potatoes and add onions, red chili powder, garam masala powder, chaat masala, coriander powder and salt. Mash and mix well. 2. Divide in portions same as number of chillies. 3. Stuff each chillie with this mix and keep aside . 1. 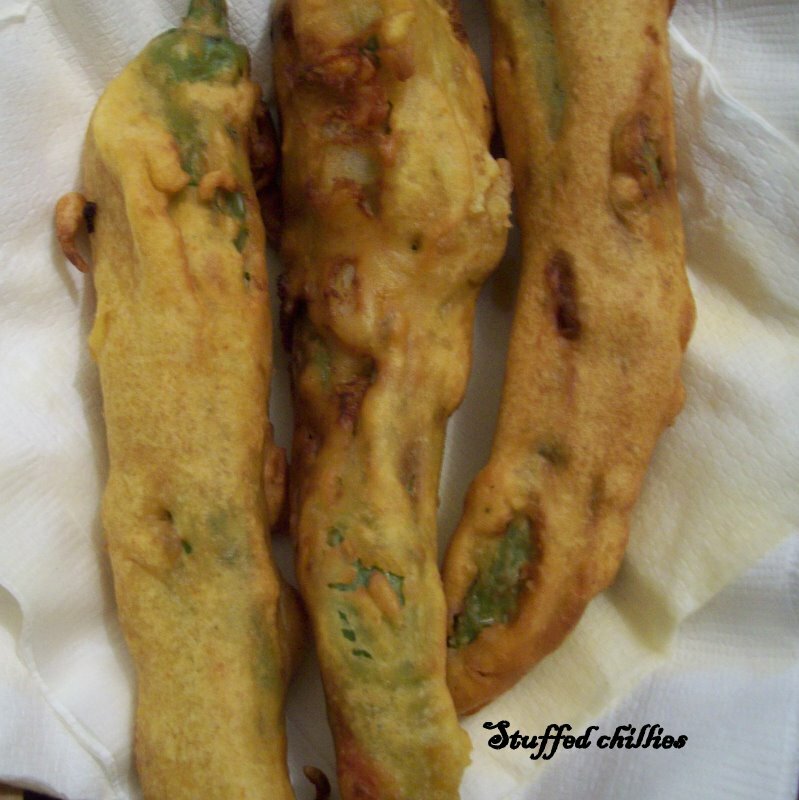 Mix all ingredients in gram flour and beat vigorously until soft. 2. It is better to add a little water at a time, whilebeating it. 1. Heat oil. It has reached correct temperature when a drop of batter dropped in it sizzles and floats to the surface quickly. 2.Dip each chilli in batter and coat it well. 4.Serve hot with Green Coriander Chutney or Tangy Tomato ketchup. 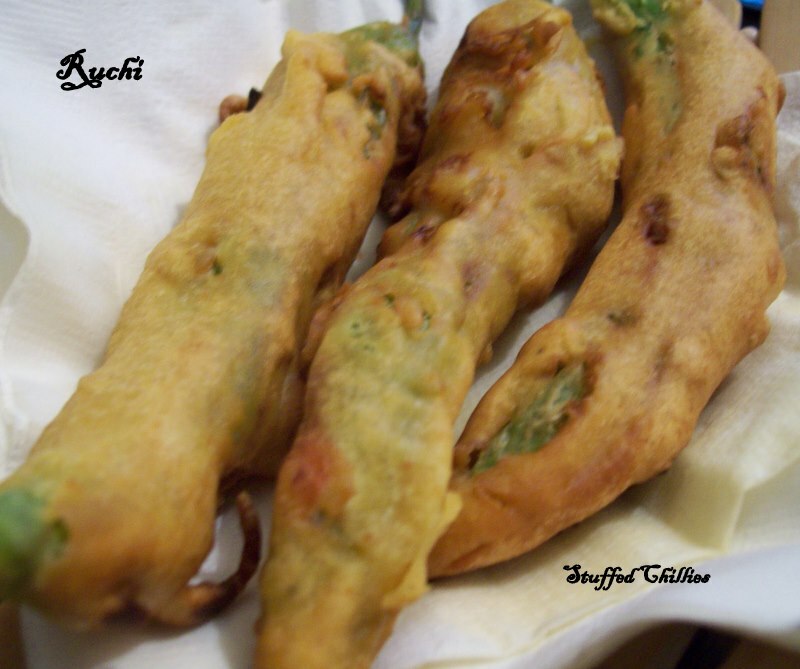 Omg, feel like having some, its too cold here Akka, seriously cant take my eyes from those irresistible fritters..
My mouth is watering now just looking at it! Super recipe! Very easy to made!